A quickie post for the current Runway Inspired Challenge. I used the colour scheme and the layering to come up with my card design. I embossed the free-form rose stamp from Printworks in three colours on three layers that were die cut with a curved edge. I finished off with a sentiment from Technique Tuesday and added a few enamel dots. 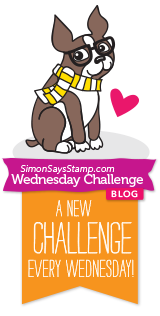 I'm also adding this to the Simon Says Stamp Emboss It Challenge. I believe you've hit the nail on the head. Awesome card. Oh I really love the 'folds'. What a cool card! Oh it's very pretty Sue! Sue, this is so pretty and such a wonderful take on the inspiration photo! Love your design and the way you used these beautiful colours! oh wow! love the interpretation of the dress on your card!! great job! thank you for playing along with us at simon says stamp! My first time to visit, and can guarantee it will NOT be my last! This is absolutely stunning, Sue! 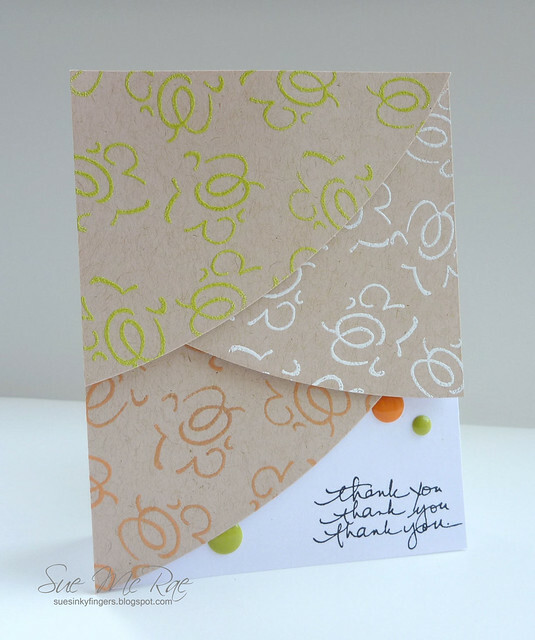 Love the layering, Sue! The handwritten sentiment also goes perfectly with those flowers! Thanks so much for joining us on the Runway!